Hytera is dedicated to providing innovative communications solutions tailored to the needs of businesses across the globe. 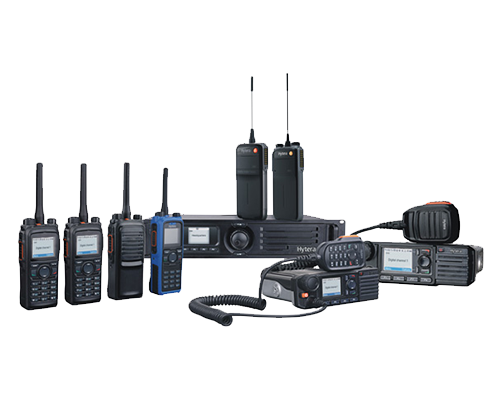 Their two way radios and wireless communications solutions have been carefully engineered for ease of use, durability and performance. Founded in 1993, Hytera has become a world leader in the wireless communications industry and is a founder member of the DMR Association. Digital Mobile Radio (DMR) is an open digital radio standard produced by European Telecommunication Standards Institute (ETSI). Being capable of voice, data and a range of other features and applications in conventional and trunking mode, DMR has received global recognitions. The Hytera DMR product range covers all that is required from terminals to infrastructure to software applications. A second digital standard, TETRA is also part of the Hytera portfolio to include a range of portable and mobile voice and data terminals, used widely by Emergency services and in mission critical applications. Design policy is for each piece of hardware to be a potential multifunction building block, thereby promoting the team’s reputation for customised delivery. This policy enables the selection of the same pieces of hardware but with appropriate software for the broad categories of radio communications that Radio Systems has addressed, PMR and MPT1327 trunking. The mobile terminal building block is the KM4000. Details of the unit itself and its capabilities are available in the Marketing and Technical Support section of the website.